So much better than the jarred stuff! In a medium pot heat the olive oil over medium heat. Add the onion and garlic, cook for 5-7 minutes. Add the balsamic vinegar, thyme, salt, and pepper; bring to a boil. Reduce to low and simmer for 30 minutes. I like my tomato sauce tangy but if it is too tangy for your taste, add just a dash of sugar. 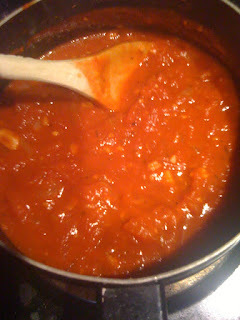 This makes a chunky sauce, puree it in a blender for a smoother sauce.